"You will be really happy with LiabilityQuoteDirect. They will take you through the quote process clearly and coherently and could provide you with a quote that you will be happy with." LiabilityQuoteDirect are part of the Bedford Insurance Group based in Tolworth, KT6. 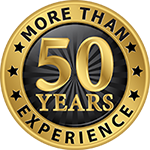 Founded in 1965, we have gained a wealth of knowledge in the Liability Insurance market and have found that most of our new enquiries come through recommendations.